Today I am guest hosting with Laura at Walking in Memphis in High Heels and Erin at The Fashion Canvas for their weekly trend spin link up. 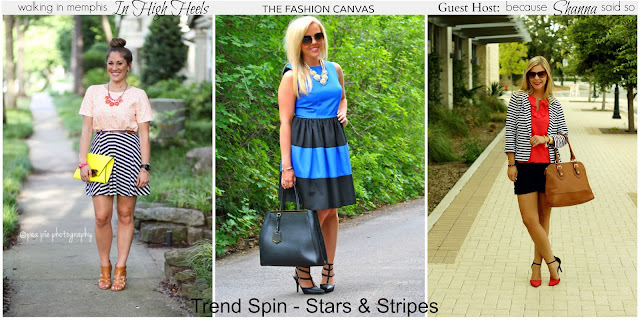 Link up your favorite stars and stripes style and join in on the fun. Who doesn't love stripes these days? They definitely make a statement when paired with solid colors like what I am wearing today. At the same time, stripes also go hand in hand when it comes to pattern mixing your wardrobe. I have mixed stripes and prints over and over again; florals, tartan and even camouflage. Basic stripe tees, jackets or bottoms don't have to be the statement piece in your outfit, but a neutral as well. In other news, I scored a pair of Zara dupes on the Go Jane website. I have been scouring eBay and Poshmark to try and find these heels that sold out quick a few seasons ago. Every time I found a pair the person selling them wanted $75 or more dollars. Um, no thanks...not for a used pair of shoes. Anyway, I was doing my weekly perusing on Go Jane and discovered these pointy toe ankle strap heels I am wearing today. You guys, they are almost identical to the Zara ones and less than $26.00. In case you are wondering, yes, they are comfortable and fit true to size. I can't wait to wear them again and are a perfect heel for every season. Have you found any good dupes lately? I swear, it seems like if you wait long enough and have the patience, some company out there will figure out a way to recreate a popular style for a fraction of the cost. Also linking up with Lauren at Style Elixir. I am drooling over your heels and can't believe the price!! I am def gonna check out this website - they have a lot of cute shoes. My pocketbook is in so much trouble! I love your take on the stripes theme. You look great! Love your blazer, you look so chic. I absolutely LOVE stripes. I have been purchasing many striped tops this summer. Those heels are gorgeous! And at that price a major steal! Those shoes are so cute! Love your red, black, and stripes look. You are looking so sharp in this look Shanna....love the blazer & shoes so much but how the lipstick matches the red is the best!!!! What an adorable combo! I always shy away from pairing black, red and white together (I'm not sure why really), but you're rocking the combination perfectly. That blazer is fabulous! Love the striped blazer with the bold red. The heels are gorgeous, what a great find. You look amazing my friend! Oh man, now I want those shoes!!!! Love them! Major score on those gorgeous heels! They are a dead ringer for the Zara ones! I seriously might get the shoes in ALL THREE COLORS. Love. Love. Love. So cute! i am loving the shorts & Blazer look lately! I am so in love with this outfit...striped perfection! this is casual but dressy and chic all at one time!! perfection! This outfit is gorgeous! So classically chic! I love that red top with the ruffle too! It's so pretty! LOOOOOVE this look! The stripes... red.. heels - so perfect! Wow those shoes are a steal! I'm going to take a look. Thank you so much for hosting with us today! This look is perfection. The stripes are lovely and your shoes are so cute!! New follower on bloglovin'! Loving this whole look! I wish I could wear dress shorts to work, but this is perfect for a ladies night out! lovely outfit. i love the bag. Love this look, lady! Black and white stripes + red is such a classic, punchy combo. :) You look great! Found your blog via the Lucky Community; so glad I did! and those shoes, I'm checking them out right now lol. i am loving your outfit miss! you look amazing in your red white and blue! I am all the way up in Canada and there is no shopping and no one ships to me therefore I have no deals I want! Get me to Austin stat so we can do some damage! LOVEEEE those shoes!! They look so similar to the zara ones I have but I love the red! I love how the theme was stripes yet everyone had such different outfits!! you are always adorable! PS you have officially convinced me to get those shoes!! OOOO this is too cute1 I'd love to do this for work! I'd also dress my daughter in this too. Pinterest has made my 7 year old quite sophisticated in her tastes. I actually ordered those Zara heels but quickly realized two things: Zara shoe sizing is CRAZY and I cannot wear 4" heels. So sad because they are beautiful shoes. But you better believe I'm going to check out Go Jane! Thanks for sharing, love! And SOO excited that you linked up with my girl, Laura today! This look is A-MAZING! Love the jacket, and the coordination with shoes is so on-point! That blazer is amazing!! And those shoes. Such a perfect look! Those shoes are awesome! I've seen other bloggers with items from Go Jane and now I can't wait to try them out! I'm revisiting this post to tell you I ordered these shoes. I can't wait to get them!